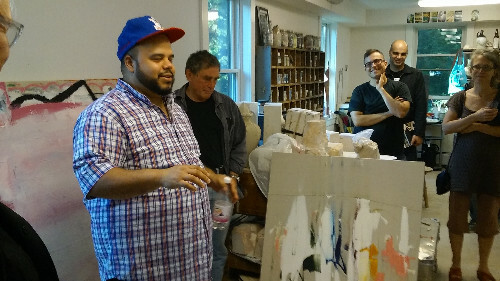 About twenty members of the art community witnessed a passionate presentation by Roberto Lugo which was followed by a tour of the studio where his new works reside. During Roberto's 45 minute presentation, Lugo shared a short (8 minute) documentary film about how he utilizes discarded household articles and converts his findings, miraculously into a workable potters wheel. 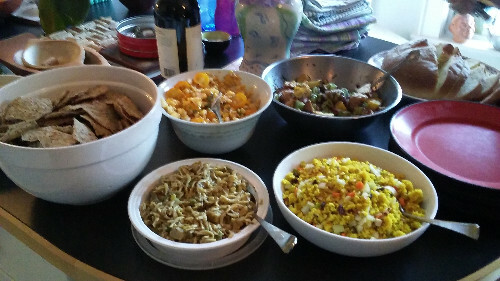 In fact, Longo made a perfect pot, on the makeshift potters wheel from the soil he sifted from the vacant lot. His point was simple, use what you have , through any means and you will be able to make art. For the documentary, Lugo returned to his impoverished neighborhood in Philadelphia. 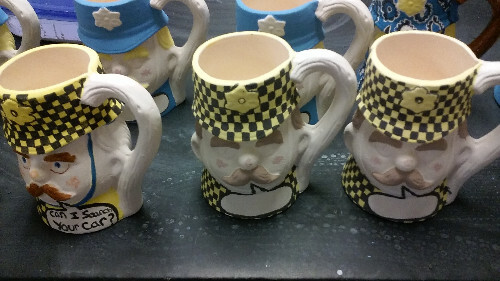 He salvaged through a drug culture neighborhood to find the apparatus to make the potters wheel. In the process he found numerous syringes. His works of ceramic and pottery are always a contradiction, taking real life situations and contrasting them with opposing views by using art as the vehicle. His works are always controversial. 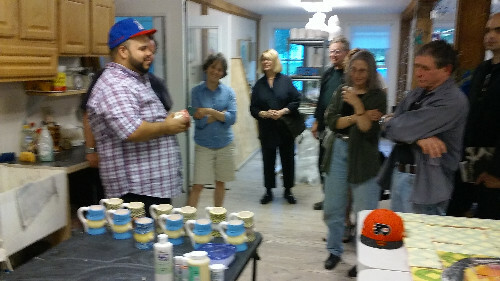 At Ferrin's pottery studio, the attendees heard first-hand what this Puero Rican native has gone through. Recognition of his outstanding work will surely emerge in the next few years. Presently, he is in a PhD program at Penn State. After several hours of enjoyment, partially due to the abundance of local cider, international wine and regional beer, it was time for us to disband. Thanks to Leslie Ferrin and the guest of honor, Roberto Lugo. It was a night to remember. Visit www.ferrincontemporary.com to learn more about Roberto Lugo.